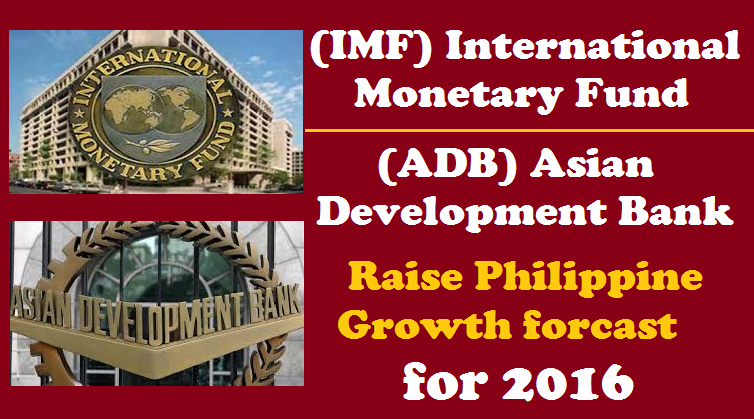 MANILA — Despite the “political noise” just a few months into the Duterte administration, multilateral lenders Asian Development Bank and International Monetary Fund raised their respective 2016 growth forecasts for the Philippines on the back of solid economic fundamentals. Following the conclusion of its executive board’s Article IV consultation with the Philippines, the IMF said in a Sept. 26 statement that the “outlook for the Philippine economy remains favorable despite external headwinds,” such that it raised to 6.4 percent from 6 percent previously its growth projection for 2016. The Duterte administration targets a “conservative” 6-7 percent gross domestic product (GDP) growth this year following a 6.9-percent expansion in the first half. “Risks to the outlook are tilted to the downside. The Philippine authorities are well equipped to respond as needed with suitable policies should any risks materialize, particularly given the strong fundamentals and ample policy space,” according to the IMF. Manila-based ADB also raised it growth forecast for the Philippines to 6.4 percent from 6 percent in the earlier Asian Development Outlook 2016, an updated version of the report released Tuesday showed. According to Richard Bolt, ADB country director for the Philippines, the rosy growth projection was on the back of robust, broad-based domestic demand, the solid foundation provided by favorable macroeconomic fundamentals, as well as plans of the Duterte administration to ramp up infrastructure spending. Bolt said particularly encouraging about the Duterte administration has been its “very solid” 10-point socioeconomic agenda aimed at slashing poverty to 17 percent by 2022 from 26 percent at present. While the jobless and poverty rates have remained high, Bolt said the new government has started addressing these challenges, and has gone “on the right track” given its higher infrastructure spending tack, plans to ease foreign investment restrictions, and moves to further cut red tape and improve the ease in doing business. It also helped that the Dutrte administration had committed to continue the effective macroeconomic policies of previous administrations, he said. For Bolt, advancing the reform agenda will be vital to lessen risks to the Philippines’ growth outlook, which is already being impacted by weaker than expected economic growth in its top trading partners. “Risks to the outlook are tilted to the downside. The Philippine authorities are well equipped to respond as needed with suitable policies should any risks materialize, particularly given the strong fundamentals and ample policy space,” Bolt said in a statement. “[The IMF’s directors] considered that the new administration has an opportunity to put the economy on a higher and more equitable growth path. [They] encouraged efforts to increase investments in infrastructure and human capital, improve targeting of social spending, enhance competitiveness and foreign direct investment, and making the financial system deeper and more inclusive,” the IMF said. The IMF also backed the plan to widen the budget deficit target to 3 percent of GDP in the medium-term to boost infrastructure development.